Restoring an old car is like rebuilding yourself from the ground up. You assess how much time, money, and energy you are willing to invest in the project and you work from the inside out. Here is some information to get you started! 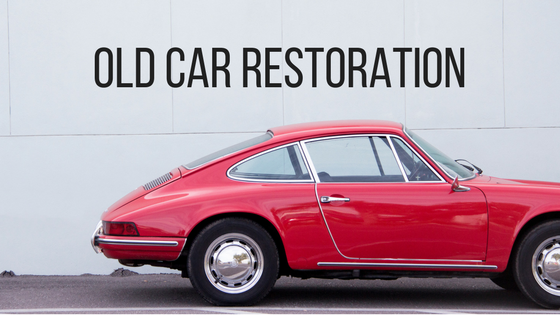 Car Restoration Meter: How much are you willing to invest? Low level: Pick a car that still runs but can use a makeover, an upgrade, and some love. Not everyone has the time or enthusiasm to rebuild a vehicle. It is still fun and valuable to gain experience working on your car. These can be people that have next to no experience with cars and require a mechanic to fix a car problem, or just somebody who doesn’t have much time! Medium level: Find yourself a car that could use some loving. Get ready to feel uncomfortable because you may have to fix a thing or two that you’re not familiar with. These are cars that may require a little welding, some elbow grease, and some oil on your clothes. High level: You can be anywhere from a complete beginner to an expert. The thing people coming from all levels have in common is a passion to build something from close to scratch. Pick a vehicle that requires welding, interior and exterior work, and parts to be fixed. These people get the full benefit of making something come to life. Work from the inside out: Before you can actually work on the car you want to ensure that it is something that you can handle. Make a list of all damaged items, including any performance parts, damaged interior, leaks, to any rusted sections. Once you figure out if you can restore the car then it’s time to go to work. People always want to start with new tires and a fresh paint job, but the inside is what counts at first. Focus on the essentials such as the engine, which is the heart of the car. Move on to hoses and any electrical components. Get to work on the transmission then the exhaust. Put on some tires and THEN you are ready for the interior. Expenses: Car parts are expensive. Try and find what parts you have that only need a cleaning or minor fixes and do those yourself. There are always places you can buy used car parts, such as Ebay, Craigslist, or junkyards. Don’t be so picky with the latest and greatest gear. Tools can be tough to come by. Your best bet is to have a friend that works on cars who can let you borrow what you need. Tips: Learn by reverse engineering. Take a car part off and really look at it, read up on it, and then put it back the same way you found it. This is how you learn about the mechanics of anything. Take advantage of resources such as books, YouTube videos, car forums, and anyone you know that works on vehicles. Car enthusiasts are usually more than happy to help with projects! There are plenty of forums online for people that have the exact same car as you. Google “year, make, model of car + forum” and you’ll find plenty of info. The internet is your friend! Final notes: You will feel discouraged at times but don’t give up. Try and involve some friends and family if you can. If all else fails, blast your favorite tunes on your speakers and you’re good to go. Top Tips for New Drivers!